March with us to demand that our elected officials stop oil and gas industries from poisoning our water, our air and ultimately our health. 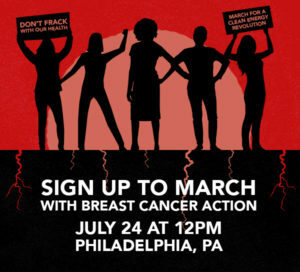 On July 24th, thousands of people will flood the streets of Philadelphia to demand a break with fracking and other toxic processes that endanger our health. As the national spotlight shines on Philadelphia for the Democratic National Convention, Breast Cancer Action and the nationwide anti-fracking movement will be inciting a revolution. We are marching to demand bold action to ban fracking across the country and keep fossil fuels in the ground. We’re joining the call for a clean energy revolution because we know that how we choose to source energy has big implications for our health. For far too long, fracking and other oil and gas extraction methods have put our health at risk. And the risks are only growing. These toxic processes, which rely on carcinogenic and endocrine disrupting chemicals linked to breast cancer, continue to expand across the nation. But instead of protecting our health, too many of our elected officials keep praising fracking and falsely claiming it can be done safely. That’s why the time for action is now. Join us. March with us. We will no longer be treated as guinea pigs in the fracking industry’s public health experiment. We’re hoping this event will be the largest anti-fracking march our country has ever seen. Join us if you can and stand up for a future that puts people before profit. Over the past few weeks, we’ve been urging you to ask questions before walking to raise money for multi-million dollar breast cancer charities. Despite millions of people raising millions of dollars walking for these charities throughout the years, 250,000 women in the U.S. are still diagnosed with breast cancer annually. If that same amount of time, energy and commitment was put into demanding an end to fracking and the dangerous drilling practices that contribute to breast cancer in the first place, imagine the change we could make together! This entry was posted in Articles, E-Alerts.